Mazar-e-Sharif International Airport (Dari: میدان هوائی مزار شریف‎, Meydâne Havâyeye Mazâre Šarif; Pashto: مزار شریف نړیوال هوايي ډګر‎) (IATA: MZR, ICAO: OAMS), also known as Mawlānā Jalāl ad-Dīn Muhammad Balkhī International Airport, is located 9 km east of Mazar-i-Sharif in northern Afghanistan, a journey of 15 minutes by taxi from the center of the city. It comes with a dual-runway capable of handling large aircraft such as Boeing 747, Boeing C-17 Globemaster III and Antonov An-225. The airport has facilities for up to 1,000 passengers, making it one of the largest airports in Afghanistan. Originally built by engineers from the Soviet Union in the 1950s, the airport serves the Afghan population north of the country. A new 60 million euro terminal was added to the airport in recent years while the older terminal is now used for domestic flights. Mazar-e-Sharif Airport was built in the 1950s by assistance from the Soviet Union during the Cold War, when the Soviets and the Americans were engaged in spreading their influences in the Middle East and South Asia. Between the 1960s and late 1970s, for the first time large number of tourists began arriving to see historical places in the city. 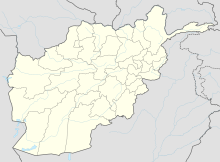 The airport was heavily used in the 1980s by the Soviet forces from which they launched daily flight missions to hit targets in the Mujahideen controlled territories of Afghanistan. It also served as one of the main hubs for deploying troops from the neighboring former Soviet Union. An American Lockheed C-5 Galaxy at Camp Marmal in Mazar-i-Sharif, Afghanistan. Germany took command of the International Security Assistance Force (ISAF)'s Regional Area North at the end of March 2006. The airfield functions as a main hub for the exchange of personnel as well as air cargo for the international stabilization and peace support forces in northern Afghanistan. Since September 2007 a TACAN installation for an instrument landing system is available for bad weather operation. Camp Marmal was built next to the airport in 2005, which has gradually expanded to one of the largest military bases in Afghanistan. It serves all ISAF personnel, including U.S. and Afghan Armed Forces. On 30 June 2014 the Royal Netherlands Air Force detachment of General Dynamics F-16 Fighting Falcon's ended. Work on a new international terminal began in 2010 and was completed in 2013. A special inauguration ceremony was held in June 2013, which was attended by German Foreign Minister Guido Westerwelle, Afghanistan's Transport and Aviation Minister Daoud Ali Najafi, Balkh's Governor Atta Muhammad Nur and some parliamentarians. After the inauguration, the airport was named Maulana Jalaluddin Balkhi International Airport. The expansion of the airport was a joint venture of Germany and the United Arab Emirates (UAE), which cost 60 million euros and took about three years to complete. The project was overseen by a Turkish company. The airport's new international terminal takes its name from Maulana Jalaluddin Balkhi, also known as Rumi. ^ "AIP - Important Information - Civil Aviation Authority". Retrieved 20 June 2016. ^ a b "Balkh airport terminal inaugurated". Pajhwok Afghan News. 9 June 2013. Retrieved 2013-06-09. ^ a b "Willkommen bei der KfW Entwicklungsbank". Retrieved 20 June 2016. ^ "Mazar-e Sharif, Afghanistan's biggest international airport". Retrieved 20 June 2016. ^ Richard (27 November 2009). "Defence of the Realm: The forgotten country". Retrieved 20 June 2016. ^ "Allied Joint Force Command Brunssum". Archived from the original on 27 July 2006. Retrieved 20 June 2016. ^ AirForces Monthly. Stamford, Lincolnshire, England: Key Publishing Ltd. October 2014. p. 33. Controlling the Air in Mazar-e-Sharif on YouTube, January 5, 2018, Resolute Support Mission.